Our Proven Winners® 'Bermuda Skies™' Flower Combination is a gently colored flowering combo bringing together the pleasing colors of a Bermuda early sunrise sky. The combination of our Superbells® Yellow Chiffon Calibrachoa, our Supertunia® Bermuda Beach Petunia and our Laguna™ Sky Blue Lobelia will transport you to tropical beaches! 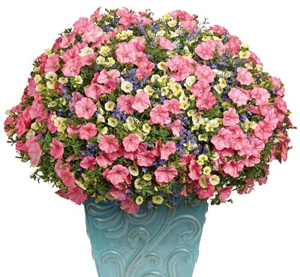 Our 'Proven Winners Bermuda Skies' Flower Combinations are grown and shipped in fine quality growing medium and are guaranteed to arrive alive and ready to thrive. Comment: Instead of spending time trying to figure what looks good with what, I found this flowering combo and couldn't be happier. It is full and beautiful with summery colors that stand out from afar. And the way it was packaged was so easy to plant.